Designing a CPU in VHDL, Part 10: Interrupts and Xilinx block RAMs | "Domipheus Labs"
Part 10 was supposed to be a very big part, with a special surprise of TPU working with a cool peripheral device, but that work is still ongoing. It’s taking a long time to do, mostly due to being busy myself over the past few weeks. However, in this update, I’ll look at bringing interrupts to TPU, as well as fixing an issue with the embedded ram that was causing bloating of the synthesized design. Interrupts are needed on a CPU which is expected to work with multiple asynchronous devices whilst also doing some other computation. You can always have the CPU poll, but sometimes that isn’t wise and/or suitable given other constraints. It’s also good for keeping time with something – vsync, for example. This is where interrupts come in – where a signal fed to the CPU externally can “interrupt” what the CPU is currently executing, and perform some other computation before returning to it’s previous task. The way I have implemented the interrupts is similar to the Z80 maskable interrupts, with an external interrupt input and an interrupt acknowledge output. The system is simplified and doesn’t have the different types of modes and non-maskable interrupts available on the Z80 but it should be enough for the needs of TPU. You can only handle a single request at a time, and there is only one mode to work with – but it’s powerful enough for most situations. At some point during execution, the system will make the interrupt input to TPU high, indicating they want the interrupt handler run. At the next writeback stage of the pipeline, just before migrating to the fetch stage, the interrupt input is sampled. If an interrupt is requested, the control unit will then make the interrupt acknowledge output from TPU active. Once the interrupt ACK signal is seen externally to TPU, 16-bits of data can be placed on the data input to TPU. After a predetermined number of cycles, the bits on the data in bus are stored. The ACK is de-asserted, and the PC of TPU is set to the interrupt handler. The handler can retrieve the data from the data bus via a new instruction, and also return to the previous PC before the interrupt was acknowledged. The external interrupt input is latched, so until it goes inactive for a cycle, remaining active will not invoke another interrupt handler invocation. any registers have had time to see and act upon write enable signals to store data. I added a 16-bit register for the ‘next PC’ and also the ‘interrupt data’ to the ALU itself, rather than adding it to the register file. There are individual set/write control lines and also data lines for them into the ALU. It’s a bit messy and adds a lot of ports to the ALU and control unit, but it worked and I can change this later if I want to tidy things up. Having the registers part of the ALU makes the instructions that access them incredibly simple and self contained. The PC unit sets the current PC to the interrupt vector, currently fixed at 0x0008. The control unit resets it’s interrupt state, and proceeds to the fetch stage of the pipeline. At the moment, interrupts are not disabled automatically when the handler is invoked, so the first instruction must be a disable interrupt instruction. There are four new instructions used to manage and handle interrupts. The Get Interrupt Event Field transfers the value on the data bus at the time after an interrupt acknowledge into a register for further use. Using this value, we can work out what caused the interrupt and perform further actions from that point. An example of this is using it with a UART, the interrupt data field could contain the uart identifier in the high 8 bits, and the byte of data which was received in the lower 8 bits. Branch back from Interrupt is similar to the reti instruction in the Z80. It branches back to the PC value which was due to be fetched next before the interrupt handler was invoked. The enable and disable interrupt instructions are fairly obvious. Perform action according to interrupt event field, or add the field data to a queue for later processing. Branch back to ‘normal’ code. Saving the registers can be done by saving to the current stack and then restoring before returning from the handler. I’ve been using r7 as a ‘standard’ stack pointer in our very ad-hoc ABI spec, so this can be done. This does use user stack, though, so it needs taken into account if stack space is a particular concern. There are a few issues that could occur, mainly in timing between disabling and enabling the interrupts. There could be a new interrupt to be handled when the enable interrupts instruction is processed, and this interrupt will then be accepted before the bbi instruction to branch back. This will destroy the original PC value when the original interrupt was raised, so I will probably change things around. There are a few solutions to this, one being that interrupts are by definition disabled when the branch to the interrupt vector occurs, and then a bbi instruction implicitly turns interrupts on again. I’ll need to have a think about the best course of action for this. The interrupt handler, whilst a bit messy in it’s implementation, works well in simulation. I’ve yet to use it when TPU is running on the FPGA with an external source, but I do not foresee many issues other than the one stated above. The UART has received a byte and signaled this. An interrupt is immediately raised. I mentioned previously that the design resources had shot up, and it turns out this is due mainly to the internal ram not being synthesized as a block ram. I was getting an internal compiler error in the Xilinx toolchain when building the existing ram with a larger capacity (I think it was 512bytes at this point) and to counter this I re-implemented the ram in another way. The way I did it, though, added an asynchronous element which in turn forced the toolchain to implement the RAM via look up tables, instead of utilizing the block ram. This is why there was a jump in resource requirements when using the Spartan6. I could not get around the internal compiler error without an async element, so off to the documentation for the spartan6 I went. Turns out there is a document specifically on the block rams available on the device I have. The block rams are used by initializing a generic object in VHDL to various constants, and then interfacing with the ports that object exposes. There are two kinds of block rams available, but I decided to use the 18 kilobit, dual-port one: RAMB16BWER. It is made up of 16Kb for data and 2Kb for parity. ISE has a nice template library for instantiation of primitives, and the block ram I use is included. 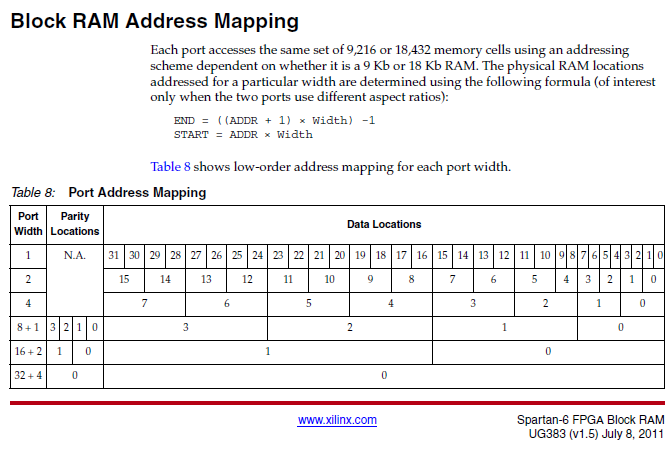 It can be found within Edit->Language Templates, and then within the VHDL->Device Primitives->Spartan6->RAM/ROM. This brings up a window with initialization code to copy and paste into your own design. I took it, and edited the relevant areas to configure it for a 16-bit addressed memory. Despite having the existing integrated ram address bytes explicitly, I decided against that with the block ram and instead addressed 16-bit values. To the TPU programmer, it still addresses bytes, but internally, it’s really stored at 16-bit, 2 byte blocks. The main reason for this was latency and complexity. By addressing 16-bit values internally in the block ram, I can implement both 16-byte reads/writes and also 8-bit reads and writes using a single port. The RAMB16BWER has a byte-wise write enable, so I can write either the high or low 8bits of a memory location internal to the block ram, leaving the other half untouched. There is one issue that arises from this method – an unaligned 16-bit read/write (i.e, the address being odd) will result in incorrect behavior. At the moment nothing happens if you try this, but I intend to add a trap/exception. I could maybe invoke the interrupt handler with a known interrupt event field value to specify an unaligned memory operation. There were several gotchas I encountered whilst trying the block ram with a testbench. The addressing scheme, first of all, was confusing. As the generic component was initialized with relevant 16-bit addressing (18bit when you include parity), I assumed it would transform the address itself into the correct form. This did not seem to be the case after running the test bench. the documentation has a table of mappings and also a formula, but in the end it only took a few minutes of inspection in the simulator to work out what was happening. The next issue was a rather silly affair! The initialization attributes for the block ram are from most-significant to least-significant order. Due to this, 16-bit instructions need byte-flipped when read in the code, and also, they go from right to left along the initialization attribute. The least significant digit of the address, specifying the high/low byte of the 16-bit memory location, is managed in the VHDL process. Ive put that process (and other relevant signal operations) below for clarity. It’s a large block of text even without some of the less important generic attributes/initializations, which I have omitted. -- SIM_COLLISION_CHECK: Collision check enable "ALL", "WARNING_ONLY", "GENERATE_X_ONLY" or "NONE"
--todo: assertion on non-aligned 16b read? The last thing to do was to add another output file generator to TASM, my c# TPU assembler. This simply outputs the whole 2KB initialization table for the input assembly. It’s then just copy/pasted into the VHDL in the appropriate attribute location. That’s it for this part. I really hope to have the next part with TPU talking to a peripheral device (and some changes to the ISA) in the next week or two. Fingers crossed! This entry was posted in Projects, TPU, VHDL by Domipheus. Bookmark the permalink.